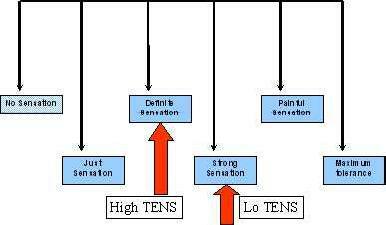 TENS is a method of electrical stimulation which primarily aims to provide a degree of pain relief (symptomatic) by specifically exciting sensory nerves and thereby stimulating either the pain gate mechanism and/or the opioid system. 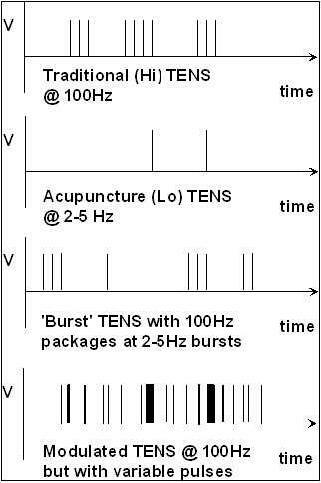 The different methods of applying TENS relate to these different physiological mechanisms. Success is not guaranteed with TENS, and the percentage of patients who obtain pain relief will vary, but would typically be in the region of 65%+ for acute pains and 50%+ for more chronic pains. Both of these are better than the placebo effect. The technique is non invasive and has few side effects when compared with drug therapy. The most common complaint is an allergic type skin reaction (about 2-3% of patients) and this is almost always due to the material of the electrodes, the conductive gel or the tape employed to hold the electrodes in place. Most TENS applications are now made using self adhesive, pre gelled electrodes which have several advantages including reduced cross infection risk, ease of application, lower allergy incidence rates and lower overall cost. Before attempting to describe how TENS can be employed to achieve pain relief, the main treatment variables which are available on modern machines will be outlined. The location of these controls on a typical TENS machine is illustrated in the diagram. The current intensity (A) (strength) will typically be in the range of 0 - 80 mA, though some machines may provide outputs up to 100mA. Although this is a small current, it is sufficient because the primary target for the therapy is the sensory nerves, and so long as sufficient current is passed through the tissues to depolarise these nerves, the modality can be effective. The TENS Unit will deliver 'pulses' of electrical energy, and the rate of delivery of these pulses (the pulse rate (B) will normally be variable from about 1 or 2 pulses per second (pps) up to 200 or 250 pps. To be clinically effective, it is suggested that the TENS machine should cover a rate from about 2 - 150Hz. In addition to the stimulation rate, the duration (or width) of each pulse (C) may be varied from about 40 to 250 micro seconds (ms). (a micro second is a millionth of a second). Recent evidence would suggest that this is possibly a less important control that the intensity or the frequency. In addition, most modern machines will offer a BURST mode (D) in which the pulses will be allowed out in bursts or 'trains', usually at a rate of 2 - 3 bursts per second. Finally, a modulation mode (E) may be available which employs a method of making the pulse output less regular and therefore minimising the accommodation effects which are often encountered with this type of stimulation. The reason that such short duration pulses can be used to achieve these effects is that the targets are the sensory nerves which tend to have relatively low thresholds ( i.e. they are quite easy to excite) and that they will respond to a rapid change of electrical state. There is generally no need to apply a prolonged pulse in order to force the nerve to depolarise, therefore stimulation for less than a millisecond is sufficient. Most machines offer a dual channel output - i.e. two pairs of electrodes can be stimulated simultaneously. In some circumstances this can be a distinct advantage, though it is interesting that most patients and therapists tend to use just a single channel application. The pulses delivered by TENS stimulators vary between manufacturers, but tend to be asymmetrical biphasic modified square wave pulses. The biphasic nature of the pulse means that there is usually no net DC component, thus minimising any skin reactions due to the build up of electrolytes under the electrodes. Pain relief by means of the pain gate mechanism involves activation (excitation) of the A beta sensory fibres, and by doing so, reduces the transmission of the noxious stimulus from the 'c' fibres, through the spinal cord and hence on to the higher centres. The A beta fibres appear to appreciate being stimulated at a relatively high rate (in the order of 90 - 130 Hz or pps). It is difficult to find support for the concept that there is a single frequency that works best for every patient, but this range appears to cover the majority of individuals. An alternative approach is to stimulate the A delta fibres which respond preferentially to a much lower rate of stimulation (in the order of 2 - 5 Hz), which will activate the opioid mechanisms, and provide pain relief by causing the release of an endogenous opiate (encephalin) in the spinal cord which will reduce the activation of the noxious sensory pathways. A third possibility is to stimulate both nerve types at the same time by employing a burst mode stimulation. In this instance, the higher frequency stimulation output (typically at about 100Hz) is interrupted (or burst) at the rate of about 2 - 3 bursts per second. When the machine is 'on', it will deliver pulses at the 100Hz rate, thereby activating the A beta fibres and the pain gate mechanism, but by virtue of the rate of the burst, each burst will produce excitation in the A delta fibres, therefore stimulating the opioid mechanisms. For some patients this is by far the most effective approach to pain relief, though s a sensation, numerous patients find it less acceptable than the other forms of TENS. Usually use stimulation at a relatively high frequency (90 - 130Hz) and employ a relatively narrow pulse width (start at about 100ms) though as mentioned above, there is less support for manipulation of the pulse width in the current research literature. The stimulation is delivered at 'normal' intensity - definitely there but not uncomfortable. 30 minutes is probably the minimal effective time, but it can be delivered for as long as needed. The main pain relief is achieved during the stimulation, with a limited 'carry over' effect - i.e. pain relief after the machine has been switched off. Use a lower frequency stimulation (2-5Hz) with wider (longer) pulses (200-250ms). The intensity employed will usually need to be greater than with the traditional TENS - still not at the patients threshold, but quite a definite, strong sensation. As previously, something like 30 minutes will need to be delivered as a minimally effective dose. It takes some time for the opioid levels to build up with this type of TENS and hence the onset of pain relief may be slower than with the traditional mode. Once sufficient opioid has been released however, it will keep on working after cessation of the stimulation. Many patients find that stimulation at this low frequency at intervals throughout the day is an effective strategy. The 'carry over' effect may last for several hours. This a TENS mode that can be employed to achieve a rapid pain relief, but some patients may find the strength of the stimulation too intense and will not tolerate it for sufficient duration to make the treatment worthwhile. 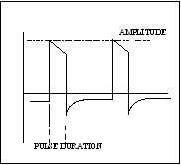 The pulse frequency applied is high (in the 90-130Hz band) and the pulse width is also high (200ms plus). The current is delivered at, or close to the tolerance level for the patient - such that they would not want the machine turned up any higher. In this way, the energy delivery to the patients is relatively high when compared with the other approaches. It is suggested that 15 - 30 minutes at this stimulation level is the most that would normally be used. 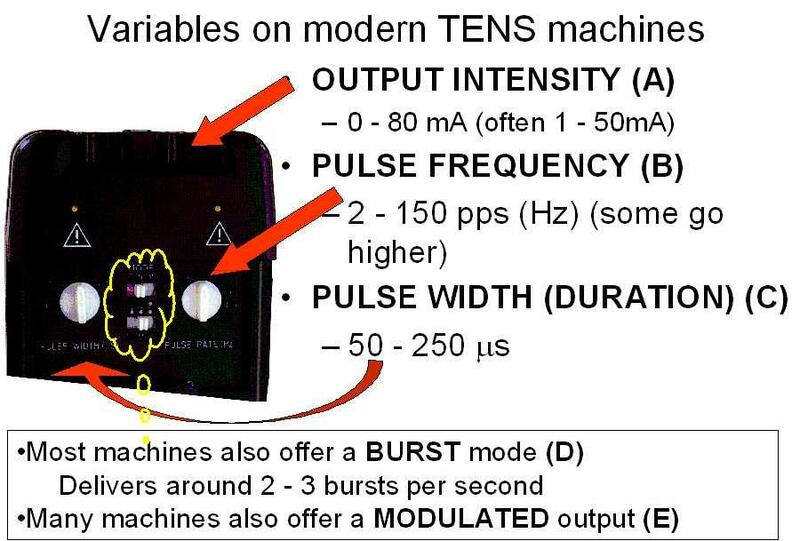 As described above, the machine is set to deliver traditional TENS, but the Burst mode is switched in, therefore interrupting the stimulation outflow at rate of 2 - 3 bursts / second. The stimulation intensity will need to be relatively high, though not as high as the brief intense TENS - more like the lo TENS. With all of the above mode guides, it is probably inappropriate to identify very specific frequencies that need to be applied to achieve a particular effect. If there was a single frequency that worked for everybody, it would be much easier, but the research does not support this concept. Patients (or the therapist) need to identify the most effective frequency for their pain, and manipulation of the stimulation frequency dial or button is the best way to achieve this. Patients who are told to leave the dials alone are less likely to achieve optimal effects. As identified above, it is not possible to describe treatment current strength in terms of how many microamps. The most effective intensity management appears to be related to what the patient feels during the stimulation, and this may vary from session to session. As a general guide, it appears to be effective to go for a 'definitely there but not painful' level for the normal (high) TENS, and a 'strong but not painful' level for the acupuncture (lo) mode. If the pain source is vague, diffuse or particularly extensive, one can employ both channels simultaneously. A 2 channel application can also be effective for the management of a local + a referred pain combination - one channel used for each component.